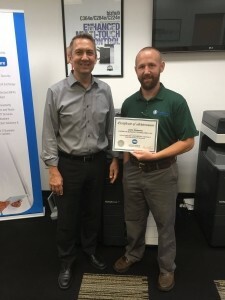 Chris Stolzman, a Service engineer at Copier Fax Business Technologies was recently recognized by Konica Minolta as one of the the top technical training students in the country. Stolzman received the Silver Seal of Excellence Award, after his recent training for models C368, 308, 224, 284, 364,454,554,558, 656 and 658. These machines are of the most popular hardware equipment provided by Copier Fax Business Technologies. Stolzman has been with Copier Fax Business Technologies since 2010, and was named April’s Employee of the Month, earlier this year. Copier Fax Business Technologies is frequently recognized for their top-rated service from Konica Minolta. They have been named a “Pro-Tech Certified Dealer” for 10 years in a row, for their continuous high performance in quality of service. This honor is only named to the top 10 percent in the country. They are the only office dealership within 150 miles of Buffalo, NY to receive this honor. The picture is Chris Stolzman, receiving his honor from our Director of Services, Jim Bodie.